As the IMF headlined last week, “current favorable growth rates will not last”. CAN ALL THIS DEBT EVER BE PAID PACK? AND IF NOT, WHAT HAPPENS? As everyone knows, borrowing is easy. Almost all governments and commentators have lined up since 2009 to support the money-printing policy. But the hard bit happens now as it starts to become obvious that the policy has failed. We now have all the debt, but we don’t have the growth that would enable it to be paid off. Central bankers simply confused cause and effect: demographics drive the economy, not monetary policy. Common sense tells us that young populations create a demographic dividend as their spending grows with their incomes. But today’s ageing Western populations have a demographic deficit: older people already own most of what they need,and their incomes decline as they enter retirement. Common sense also tells us that leverage equals risk – if it works out, everything is fine; if not…..
Financial markets are doing their best to warn us that the problems are growing. Longer-term interest rates, which are not controlled by the central banks, have been rising for some time. They are telling us that some investors are no longer simply chasing yield. They are instead worrying about risk – and whether their loan will actually be repaid. Essentially, we are now in the and-game for stimulus policies. Major debt restructuring is now inevitable – either on an organised basis, as set out by Bill White, the only central banker to warn of the 2008 Crisis – or more chaotically. This restructuring is going to be painful, as the chart above on the impact of leverage confirms. I originally highlighted it in August 2007, as the Crisis began to unfold – unfortunately, it now seems to have become relevant again.. Leverage makes people appear to be geniuses on the way up. But on the way down, Warren Buffett’s famous warning is worth remembering: “Only when the tide goes out do you discover who’s been swimming naked”. *Return on Equity is the fundamental measure of a company’s profitability, and is defined as the amount of profit or net income a company earns per investment dollar. 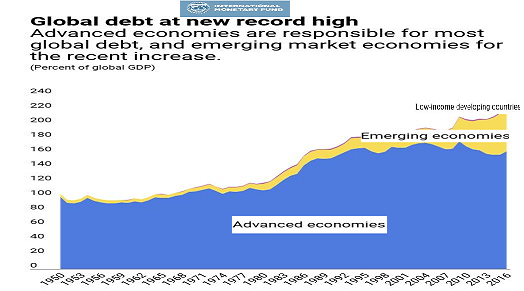 The post The tide of global debt has peaked: 8 charts suggest what may happen next, as the tide retreats appeared first on Chemicals & The Economy.